Natural light floods this clean, open studio space to create an inspiring mind and body experience. 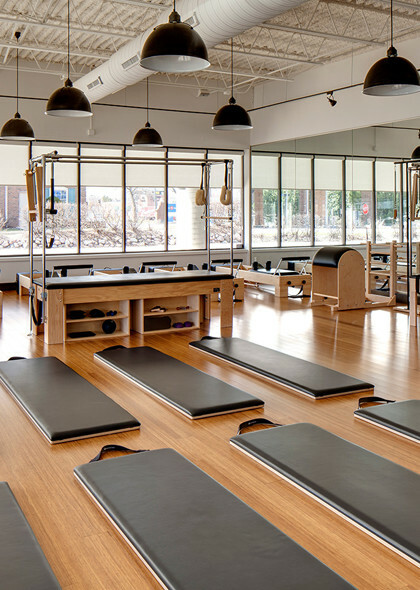 The open concept allows for a variety of equipment configurations while grasscloth wallpaper, natural hardwood and lively plants allow for a harmony between members and trainers. With the help of Wade Weissmann Architecture, we were able to shape what was once a simplistic retail space into a haven for fitness and wellness. Pure white walls make the wooden floors and equipment stand out and a combination of dome and rail lighting attract little attention, resulting in a focused fitness experience.